Safety couplers for compressed air (in accordance with Dutch health and safety regulations). Available in EURO fitting (air passage ø 7 mm) and ORION fitting (air passage ø 5 mm). 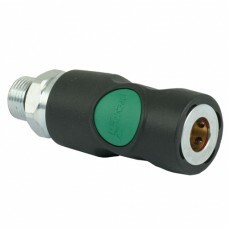 One push safety coupler with ORION fitting, 1/2" female thread Avoids hose whip. Ergonomic ..
One push safety coupler with ORION fitting, 1/2" male thread Avoids hose whip. Ergonomic on..
One push safety coupler with ORION fitting, 1/4" female thread Avoids hose whip. Ergonomic ..
One push safety coupler with ORION fitting, 1/4" male thread Avoids hose whip. Ergonomic on..
One push safety coupler with ORION fitting, 3/8" female thread Avoids hose whip. Ergonomic ..
One push safety coupler with ORION fitting, 3/8" male thread Avoids hose whip. 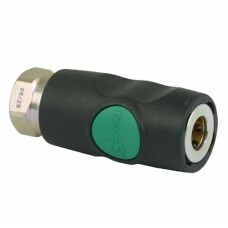 Ergonomic on..
One push safety coupler with ORION fitting, Hose Stem 8mm Avoids hose whip. 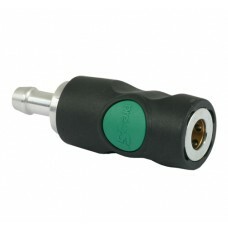 Ergonomic one-h..
One push safety coupler with ORION fitting, Hose Stem 10mm Avoids hose whip. 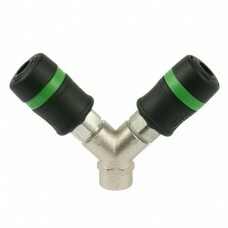 Ergonomic one-..
One push safety coupler with ORION fitting, Hose Stem 6mm Avoids hose whip. Ergonomic one-h..
Twin coupler with EURO fitting, 1/4" female thread with sliding sleeve operation. By moving the s..
One push safety coupler with EURO fitting, 1/4" male thread Avoids hose whip Ergonomic one-..
One push safety coupler with EURO fitting, Hose Stem 6mm Avoids hose whip Ergonomic one-han..
One push safety coupler with EURO fitting, 1/4" female thread Avoids hose whip Ergonomic on..
One push safety coupler with EURO fitting, 3/8" female thread Avoids hose whip Ergonomic on..
One push safety coupler with EURO fitting, 3/8" male thread Avoids hose whip Ergonomic one-..
One push safety coupler with EURO fitting, Hose Stem 8mm Avoids hose whip Ergonomic one-han..